You’re not really a survivalist, perhaps not even a reluctant prepper, but if you’re reading these words you probably harbor serious doubts about the long-term viability of the present system. With this in mind individuals and families should, at the very least, take a few prudent steps to help mitigate future disruptions. Having a supply of potable water, fuel, nonperishable food, first aid supplies, and weapons suitable for self-defense is just common sense. With preparedness in mind, one of the most profitable activities a family can pursue is growing some of their own food. Gardening provides healthy, outdoor exercise that produces food of superior quality at below supermarket prices. It is also an educational activity teaching children about the natural world. If you have a background in agriculture or horticulture the information presented here will be “old hat.” This article is intended for those with little or no knowledge of gardening, but want to start planting this spring. First, a few general recommendations: No matter how enthusiastic you feel -– start small. A 10’ x 12’ plot would be good, even smaller if you lack free time. When you start small you’ll make small mistakes. Learn as you grow. Expand your operation as you gain knowledge. Also, by starting on a modest scale you’re not likely to experience burnout. While you can grow an amazing amount of food in a small space, forget romantic ideas about self sufficiency. In the beginning your family will be able to eat out of the garden for several months a year. As you expand you can start preserving your harvest by canning, pickling, and freezing to supplement your diet during the winter. I define survival gardening as growing fruits and vegetables for home consumption in a way that produces the maximum output with a minimum of inputs. Really, it’s just old-fashioned utility gardening. It’s the type of gardening most of our ancestors did for centuries. It’s the type of gardening still practiced in much of Eastern Europe and Russia today. In the past every abode, from the smallest cottage to the grandest manor house, had a kitchen garden. The first thing you need for a garden is some ground. No hydroponics here; remember, minimize inputs. Container gardening, that is, growing in pots, also involves increased inputs, though if all you have is a patio, deck, or balcony go for it. You cannot, however, use plain garden soil in containers. You’ll need potting mix, though you can save money by making your own. The most important consideration in site selection is sunlight. Other shortcomings can be overcome, but most of the plants you’ll be growing do best in full sun. Sunlight supplies the energy for photosynthesis. You should have an area with a minimum of eight hours of direct sunlight, more is better. Clear away shrubs and small trees, larger trees can be limbed up to let in more light. Incidentally, if you rent rather than own your property and need to dig up lawn for a veggie garden keep in mind that grass can be replanted and turf quickly reestablished. After sun, level ground is a big plus, the flatter the better. Hillsides can be terraced, but remember – minimum inputs. If you do have a slope, contour planting is required. Run your furrows perpendicular to the slope so each row acts as a little dam to prevent erosion during a heavy rain. Furrows also promote drainage on level ground. Speaking of rain -– a water source is required. Even if you live in a region where precipitation is usually reliable, rainfall can never be counted on. Seeds and seedlings should be watered in, and summer droughts are also possible. Trucking and toting water in is a last resort. Don’t over water. A couple of deep soakings during a dry spell is much better then spraying with a garden hose every evening. So far I haven’t mentioned soil except to say you can’t use plain field soil in containers. The ideal soil is a sandy or silty loam with high natural fertility and a slightly acid ph. There is little chance your soil will be ideal, but unless you live on a rock ledge there is no need to bring in new soil –- remember, minimum inputs. The idea is to improve your existing soil. Fortunately, there’s a cure all for soil -- organic matter (OM). The most common organic materials used in gardens are leaves and grass clippings. One great thing about these is they are free, in fact many people throw them away. Grass clippings are excellent –- they decompose quickly and have a relatively high nitrogen content. Make sure the clippings you use came from turf that was not treated with harmful pesticides. Many lawns today are treated with a broad-leaf herbicide such as 2, 4-D which is exactly what you don’t want in your garden because most vegetables are broad-leaf plants. What does OM do? If you have light sandy soil, excessively drained (i.e., doesn’t hold moisture), OM will add body and water holding capacity. If you have heavy, poorly drained clay soil OM will break up the clods making it more friable and crumbly. Although most OM does not contain high levels of nutrients it increases the ability of plants to take up the nutrients present. Manure is one type of OM with relatively high levels of nutrients. Well-rotted manure is easier and more pleasant to use, and will not burn your plants. Do not use wood chips or other woody materials. They have little nutrient value, decompose slowly, and may even tie up nutrients in the soil. Extra OM can be stored in a compose pile. My enthusiasm for OM might lead you to believe I’m an organic gardener, but strictly speaking I’m not. If you want to try all organic, more power to you. A bit more about that later. Organic and inorganic fertilizers are not mutually exclusive. OM will lessen the need for inorganic fertilizers, but I use both. In many states the agricultural extension service offers low-cost soil testing that will tell you which nutrients your plot lacks. In lieu of a soil test you can make a light application of a general purpose fertilizer such as 10-10-10 which is 10 percent nitrogen, 10 percent phosphorus, and 10 percent potassium. Do not use so called lawn food that is high in nitrogen. The use of inorganic pesticides such as insecticides and herbicides are generally not necessary in smaller garden plots. Having a variety of fruits and vegetables grown on a small scale reduces insect pests. Weeds can be eliminated by hoeing or hand pulling. Don’t let weeds get ahead of you. 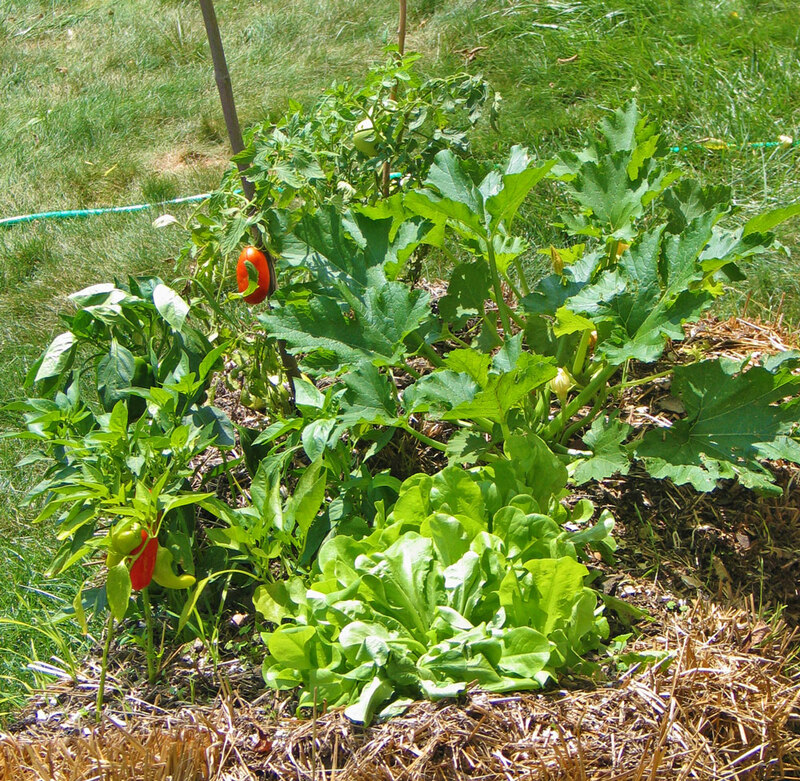 A few minutes weeding twice a week is much easier than trying to clean out an over-grown garden. While you’re at it you can pick off any offending bugs. You’re going to need a few hand tools to get started. At a minimum you’ll need a long-handled digging shovel to turn over the soil, and a hoe to break up clods and for weeding. Experience will tell you what other hand tools to acquire. You’ll need a wheelbarrow for carrying things. Don’t buy a Mickey Mouse model; get a six cu. ft. or contractor’s size. Medieval manuscripts show workers using wheelbarrows, and they were probably in use long before that time. No conveyance is as maneuverable for carry heavy loads as a wheelbarrow. If you expand your operation you may want to buy a rototiller. The best are rear-tine models with at least an 8 hp engine. Buy quality tools, take care of them, and they’ll last a long time. Keep in mind that garden tools are often available at yard sales, and power equipment can usually be rented by the hour or day. Now that that you’ve selected and prepared a site the next question is: What to grow? This is a fairly easy one to answer: What does your family like to eat? And what will grow well in your area? Obviously growing a great crop of zucchini that no one wants to eat is a waste of time and money. The choice is subjective, but I’ll make a few suggestions. Almost everyone likes vine-ripe tomatoes. In fact tomatoes are the most widely grown backyard vegetable. Cucumbers are ridiculously easy to grow, and can be eaten fresh, or pickled whole or in relish. Potatoes are a survivalist crop par excellence. Some desirable crops may take up too much space for a small garden. Sweet corn is great, but requires a relatively large area to produce a good yield. Certain vine crops such as pumpkins and watermelons tend to sprawl over large areas. Another consideration in crop selection is your climate. Some vegetable varieties require a very long growing season. So, if you are like me and live in USDA hardiness zone 3/4 your selection is somewhat limited. Fortunately, in recent decades plant breeders have produced quickly maturing varieties so that even far-north locations can now grow most common vegetables. If you own rather than rent your land and plan to stay there a while I recommend investing in fruit trees and berry bushes. Fruit trees (buy them bare root in the early spring) can be a bit pricey, but properly cared for they will produce for many years. Again, be sure the varieties you plant are compatible to your soil and climate. Where I live we can grow excellent apples, but a peach tree would never make it through the winter. Once you start gardening you might find yourself in a community of gardeners. Although there is a bit of friendly competition for the sweetest strawberry or the earliest tomato, most gardeners are free with information and advice. Another source of information already mentioned is your extension service. They have a wealth of know-how particular to your region. If you doubt that government can play a constructive role in society the extension service might convince you otherwise. Well there you have some of the basics. So, start planning to get growing this spring. (1) For a general overview on this subject see: Nelson Rosit, “Racial Ecology, Part II: Brown and Green, 1920-1945.” The Occidental Quarterly, 16 no. 1 (Spring 2016) 31-51. (2) Mark Deavin, “Henry Williamson: Nature’s Visionary,” National Vanguard, #117 (March-April 1997) 17-20. I'd like to add that your state agricultural agencies often have useful information as to plants that favor local conditions, and planting times to name a few bits of information they provide. Jim Mathias wrote: I'd like to add that your state agricultural agencies often have useful information as to plants that favor local conditions, and planting times to name a few bits of information they provide. Your local university may be able to help as well. I have called the University of Tennessee extension with gardening questions before, and they are always very thorough and knowledgeable. Thanks, fellows. Survivalism is the first new topic we've added to WB since we launched this little forum back in mid-2013. It's the best place to put Mr. Rosit's article. We'll be adding more new topics soon and culling all of the deadhead "members" who joined but didn't post or return. It's about time, eh? More changes will be made to accommodate National Alliance members in the Supporters Only section as was originally intended, for example. Of course that was 1 &1/2 years before our Alliance under new leadership was launched by me and Kevin Strom. I focus on foods that store a long time for survival gardening and have been doing it for quite some time. I have a root cellar and have made pumpkin pie the following July they keep well as does butternut squash we have actually had them in the root cellar when we were picking this years crop. Beans are another great food for storing dried out they can last a couple of years in airtight containers. Sun chokes are great also because they grow like weeds establish a patch as a future cash and don't rule out local woodlots and meadows if you don't have much yard. "Out of site out of mind". I am also into long term storage. I use dehydrators and a seal-a-meal. If you dehydrat meat completely, you can create survival meals that will last for years. If you use Mylar bags, you can get 25 year storage. I produce the same meals that they have in the survival magazine for pennies on the dollar.